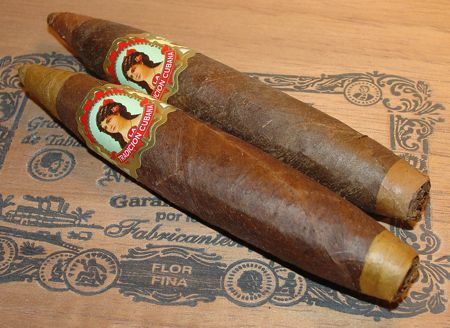 La Tradicion Cubana’s Chulo cigar is the perfecto in their figurado series. Other formats in the series are a Culebras, a huge 8 1/2 by 96 Great Pyramid, and the Reed, a toro-sized cigar with a head shaped like the bit on a clarinet (similar to La Flor Dominicana’s Chisel.) There is also a limited box pressed cigar called Teclas which comes packaged in a box shaped like a piano. Talk about showmanship! With its two-toned appearance and shapely figure, it’s almost a shame to put the Chulo to the flame, and I find myself torn… To smoke or not to smoke, that is the question. Whether ’tis nobler in the mind to keep a cigar as a museum piece, or to take up matches, and by smoking, ash it… But there’s nothing rotten in Denmark here, or in the Dominican Republic for that matter. In addition to its exotic appearance, the Chulo is also a fine tasting smoke. The 5 x 54 Chulo (which means something like “cutie”) is available in two wrappers — a natural Ecuadorian and a Brazilian maduro, but the extremities of the cigars are wrapped in the opposite shade. I found that I had to clip most of the natural wrapper off the tip of the maduros I smoked, but the flavor of the Ecuadorian leaf at the foot was detectable for a few brief moments after lighting the cigar. The craftsmanship that goes into creating this little zeppelin is apparent at first glance. 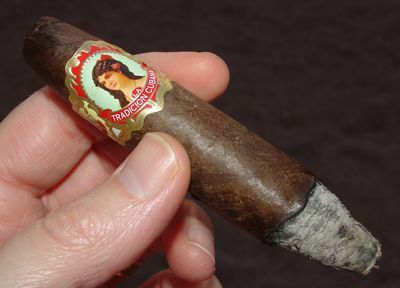 The dry but dark maduro wrapper creates a striking contrast against the natural leaf at the foot and head of the cigar. Both ends of the Chulo are finely finished. The roll is solid and the draw is good, though to achieve this it is sometimes necessary to cut a little further down — all the way to the boundary of the maduro leaf — than seems optimal. They burn evenly and need to be ashed only once or twice. My only criticism is that the cigar gets a bit hot in the last third, but that is probably just a natural hazard of a cigar shaped like this. Despite its advertised ring gauge, the Chulo is a fairly small cigar. The first flavors to come wafting from this little guy are smooth and nutty, due in part to the Ecuadorian wrapper which gets the ball rolling. The smoke is creamy and medium in body. It doesn’t take long before the natural wrapper gives way to the bittersweet chocolate aroma of Brazilian maduro. The smoke is still smooth, but its character changes dramatically. The sweetness on the nose remains but is soon overpowered by earthiness on the palate, and this becomes the primary theme of the cigar. In the final section some peppery elements enter to complement the earthiness, and the cigar starts to heat up a little. I found it best to slow my pace at the mid-point of the cigar to keep the smoke cool and to keep the earthy flavors in proportion to the sweetness. 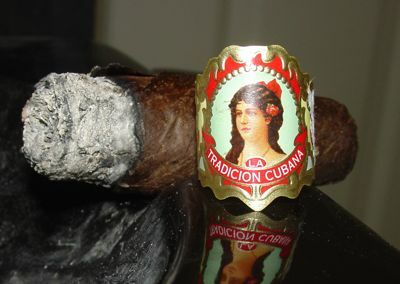 La Tradicion Cubana has a reputation for virtuoso cigar making, and this is exemplified by all of the cigars in the Figurado series, including the Chulo. But I was happy to discover that the cigar is more than mere eye candy — it’s a dandy little smoke with lots of smooth and earthy maduro flavors. It’s also pretty obvious that the chef who whipped up Sabor Cubano was supervising the design of the Chulo as well. I’ll be looking forward to trying the natural version one of these days, but for now I can vouch for the maduro: it’s good. Boxes of ten sell for around $60 USD, which is a fantastic price considering the craftsmanship required to make these two-toned perfectos. Damn, looks just like La Caridad del Cobre, which I haven’t had either, but is on my wish list. I think they’re made in the same factory. It would be interesting to compare them. Sharp eye, by the way.